It was 2008 going on 2009 when Sharad Amalean turned to his elder brother Mahesh Amalean and said, “This is going to unravel completely.” It wasn’t news to Mahesh, who as Chairman of MAS Holdings had watched as the company reeled under the economic downturn. As orders dropped, they had had to lay off people for the first time, releasing 3,000 employees and closing factories in Sri Lanka and India. “That was probably the toughest moment for me,” Mahesh says now. 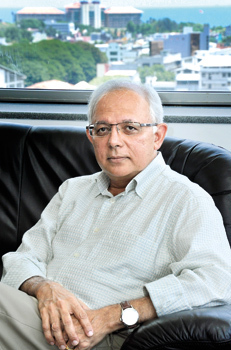 Mahesh Amalean: Going on to the next level as Chairman of the groundbreaking Sri Lanka Institute of Nanotechnology. Their existing businesses were not generating enough cash while newer investments were sucking up tremendous amounts of it. “It was that scary but we didn’t share that with anyone. We would walk out the door and say, ‘Let’s roll up our sleeves, put our shoulders to the wheel, get down to the floor, work with our people and bring it back’.” The brothers Amalean were not giving in without a fight. In the years leading up to this point, MAS Holdings had built a reputation as manufacturers of fine lingerie and showed the growth to back it – as much as 20% – 30% a year. When Mahesh, Ajay and Sharad founded the company in 1986, they were the newest chapter in a family tradition that stretched back for longer than Mahesh can remember. The eldest son, Mahesh was 15 when he and his siblings lost their father. As their large, extended family rallied around them, his grandfather remained its head and the man running their manufacturing business. Despite the powerful tug of tradition, as a young man Mahesh wanted nothing to do with textiles. Instead, when he went to Chennai it was to study engineering. (He would meet Shaila, the woman who would become his wife, there.) However, as the eldest grandson he could not say ‘no’ when, upon his return, he was asked again to be a part of the company. For seven years Mahesh worked with his family and he remembers those as tumultuous times. Over the years, the answer to that question has changed, and changed again – sometimes the most compelling reasons have emerged out of the conglomerate’s biggest crisis. Case in point – the Chinese suppliers of bra cups who won over customers and the industry when they began manufacturing a seamless, completely bonded bra. MAS abruptly lost 40% of their business. Looking back, Mahesh charts the path they took: when Sri Lanka was not known as manufacturers of lingerie, MAS went into that more by “default than by design”. “Then to support that manufacturing we invested in the supply chain. Then to address increasing needs of the customer we invested in product development and design, and then because of the shock we got from that Chinese company, bringing out not a cheap Chinese product to the table but an innovative product we realised we also needed to bring that into our armoury as a solution,” he says. Always willing to learn, Mahesh’s visionary approach has led him and his team to adopt business philosophies that have saved the company more than once. That they studied Toyota’s lean manufacturing method and adapted it to their work and the Sri Lankan context was perhaps what allowed them to navigate the unpredictable markets produced by the economic downturn and emerge the stronger for it. “The whole concept of being frugal, of making sure we didn’t waste, maximising what resources we had, all became a part of the DNA of the company,” he explains. Now, Mahesh’s interest has shifted to Silicon Valley where his visits to icons like Google and Facebook as well as to the World Innovation Forum have been about understanding how to build a corporate atmosphere which attracts innovative people and allows them to thrive. “We are on the journey now,” he says. “I think in being an innovative company you’re really going against the rest of the crowd. You need conviction it will take you somewhere.” It’s this conviction that Mahesh shares with the man whose memory he will be honouring as he delivers the 2013 Ray Wijewardene Memorial Lecture. “Our paths never crossed, I was an industrialist and he was an innovator focused on agriculture.” However, his research led Mahesh to the conclusion that Ray had used his intelligence and creativity to see what he could do to help Sri Lanka make a critical transition from an agricultural to an industrial society. The Ray Wijewardene Memorial Lecture 2013 is on August 22 at the Institute of Engineering Sri Lanka Auditorium (120/15, Wijerama Mawatha, Colombo 7) from 5.15 p.m. onwards. The Ray Wijewardene Charitable Trust was established in January 2011 to promote the vision and ideas of the late Dr Ray Wijewardene, the illustrious Sri Lankan engineer, inventor and specialist in both tropical farming and renewable energy. The Trust recognises and supports innovation in sustainable agriculture, renewable energy, engineering and aeronautics – disciplines and pursuits that were close to his heart for over half a century. The Trust also preserves his personal archives. Published in The Sunday Times, Sri Lanka on 18 August, 2013. Words by Smriti Daniel. Pix by Susantha Liyanawatte.